Enhanced Active FX is a fractional carbon dioxide (CO2) laser resurfacing technique developed by Robert Langdon, M.D. Enhanced Active FX can provide dramatic improvement in sun-damaged facial skin with only one treatment. Treatment with the enhanced mode of Active FX results in significantly more tightening of sun-damaged facial skin than is possible with standard Active FX laser resurfacing. Enhanced Active FX provides the best possible improvement while minimizing the recovery period and the risk of side effects. The term “laser resurfacing” refers to laser treatment (almost always done on the face) that results in replacement of superficial skin layers with new skin tissue. Resurfacing has a rejuvenating effect because the old sun-damaged skin is replaced with new undamaged skin. Resurfacing treatments take advantage of the skin’s ability to spontaneously heal after an injury. Fortunately, most sun damage (photo-aging) in skin occurs in superficial layers that can safely be removed by resurfacing. Common signs of sun damage include wrinkles and excessive pigmentation (“sun spots” or “age spots”). Several different types of lasers can be used for facial resurfacing. As discussed in Dr. Langdon’s book “Understanding Cosmetic Laser Surgery,” the CO2 laser is the most effective for this purpose. The greatest advantage of treatment with the CO2 laser is that the skin will contract (shrink) during treatment. Contraction of skin can dramatically reduce wrinkles and is especially helpful in patients who have relatively severe sun damage with significant wrinkles in the cheeks and “crow’s feet” (to the side of the eyes) areas. 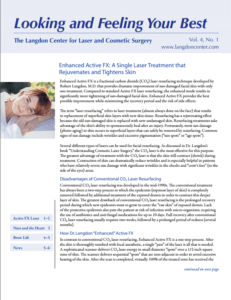 Conventional CO2 laser resurfacing was developed in the mid-1990s. The conventional treatment has always been a two-step process in which the epidermis (topmost layer of skin) is completely removed followed by additional treatment of the exposed dermis in order to contract this deeper layer of skin. The greatest drawback of conventional CO2 laser resurfacing is the prolonged recovery period during which new epidermis must re-grow to cover the “raw skin” of exposed dermis. Lack of the protective epidermis also puts the patient at risk of infection with micro-organisms, requiring the use of antibiotics and anti-fungal medications for up to 10 days. Full recovery after conventional CO2 laser resurfacing usually requires two weeks, followed by a prolonged period of redness (several months). In contrast to conventional CO2 laser resurfacing, Enhanced Active FX is a one-step process. After the skin is thoroughly numbed with local anesthetic, a single “pass” of the laser is all that is needed. A sophisticated scanner delivers CO2 laser energy in small diameter “spots” over a 1/2-inch square zone of skin. The scanner delivers sequential “spots” that are non-adjacent in order to avoid excessive heating of the skin. After the scan is completed, virtually 100% of the treated zone has received the laser energy. The biggest advantage of total skin coverage is that nearly all age spots on the face can be eliminated with a single Enhanced Active FX treatment. During the Enhanced Active FX treatment, Dr. Langdon carefully delivers hundreds of scans to the entire face (except the upper eyelids and eyebrows). He varies the power level of the scans in order to maximize improvement and minimize the risk of side effects. The main innovation of Dr. Langdon’s “Enhanced” Active FX is that he varies the scan rate by changing the power settings of the CO2 laser. Higher power will increase the scan rate and impart a greater heating effect on the skin. The target of this increased heat is the deeper dermis layer of the skin, in which collagen fibers will immediately shrink, providing significant contraction of wrinkled, sun damaged skin. The result is smoothing of wrinkles, which is especially evident in facial areas with “looser” skin including the cheeks and temples. Another great advantage of Enhanced Active FX is that the protective epidermal layer remains intact after the treatment. Presence of the intact epidermis prevents the “raw skin” exposure that occurs after conventional CO2 resurfacing. After Enhanced Active FX treatment, the patient needs only to apply a moisturizer during the several day recovery period. There is no need for wet compresses, wound dressings or antibiotics. The protective epidermis will simply peel off on its own after 4 to 5 days. Fresh new skin will then be revealed. This fresh skin will be much smoother. Because most age spots are confined to the old epidermis, they will peel off along with the treated epidermis. If you have significant sun damage with facial wrinkles and age spots, please call our office to schedule a consultation with Dr. Langdon. Enhanced Active FX may be a great option for you. 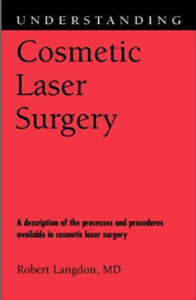 For an in-depth discussion of the skin and how lasers are used to improve its appearance, see Dr. Langdon’s book “Understanding Cosmetic Laser Surgery.” Call Us for a Consultation at 203-745-0340today!